The Latin name for the grey seal translates as ‘hooked-nosed sea pig’, which is a rather rude description of this slightly comic and endearingly ungainly mammal. 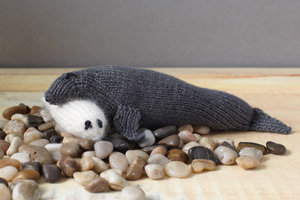 Oddly, the grey seal is more common than the common seal in British waters. Grey seals have a strong bond with their pups; the mother is so devoted to feeding that she can lose up to 65kg while suckling her young. One of the numerous collective nouns for seals is a plump.